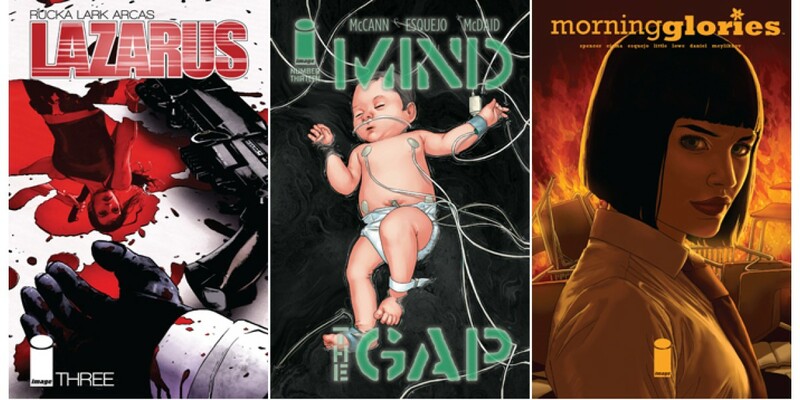 Every week, Image publishes a bevy of creator-owned comics that our fans are eager to enjoy and the press is eager to review. We’ve got a round-up of a few reviews that caught our eye this week, so if you’re on the fence for any of our titles, take a look at this selection of reviews and see if anything piques your interest. Alison Berry of Comicosity loved LAZARUS #3: "Michael Lark and Santi Arcas are a fantastic pair on the art, with Arcas’s contributions as colorist really making an impact. We bounce between at least four different set pieces in 22 pages, and Arcas has a distinct color palette for each. Bright blue for the Twin’s house in LA, beige for the desert compound, bold purples and reds for the sunset drive. Lark’s gift for conveying personality with faces is a treasure. If I could exude just an ounce of Forever’s attitude from those first few pages, I’d never have to say anything twice again. I really enjoyed how something as little as a smirk or a vague frown had me filling in story blanks in my head. Every character looks like they could step off the page any minute." Russ Pirozek of DigitalNoob gave MIND THE GAP #13 an A, thanks in part to McCann's plotting: "Weaving a masterful plot, McCann is hitting the point where the major seeds he’s sown throughout these first thirteen issues are about to finally pay off, and with that comes the expectation for a huge resolution for what has been an amazing series." Harrison Rawdin of Unleash the Fanboy likes how the puzzles in MORNING GLORIES are nested within each other: "The written word by Nick Spencer simply shines with glorious intent, as eager followers peel back pages that are sure to excite them. As one sentence devours another the complicated layers of this tale build a narrative that’s compelling even if it is a bit confusing. It might seem like this is more of a frustrating aspect of this saga, but at this point each release feels like we’re getting more answers that inevitably lead to tough to solve questions. And thanks to the work of the scribe I can honestly say that I am thoroughly enjoying the ride even as the conundrums pile up." It's an old joke, but sometimes old jokes are the best jokes. Vince Ostrowski of Multiversity Comics digs SECRET #3, especially the work of the art team: "Bodenheim supplies a few recurring visual motifs that are worth looking out for and require more thoughtful reading than the book initially seems to demand. Whether he’s framing an action scene in a mirror or shattering a mirror in an emotional scene, his art suggests more than meets the eye. There’s an emotional undercurrent bubbling within our complicated heroes. Michael Garland’s simple and selective color choices give the book a distinct look that plays around with similar color conventions of the espionage/crime genre. Garland peppers rich reds throughout the usual greyscale to punch up the details." Hansel Moreno of The Weekly Crisis keeps it short and sweet, proclaiming SKULLKICKERS #24 a must-read and saying: "In the spirit of the previous Tavern Tales, Before Skullkickers is hilarious with precious plot nuggets sprinkled here and there." Harrison Rawdin of Unleash the Fanboy gave THINK TANK #9 a perfect score and wants more: "Rahsan Ekedal once again lends his pencil and from start to finish the work on display is beyond impressive. From the character designs to the use of set pieces and military technology this illustrator has a firm grasp on the world that he gets to play in. The visual aesthetics here are top notch, so much so that I have no complaints except to say I want more."